If you haven't yet, make sure you enter my giveaway! It ends tonight and it's your chance to win a bottle of OPI Spotted, as well as three of my favorite polishes from the OPI San Francisco collection that is brand spanking new for fall. I finally got around to swatching one of the polishes from the three pack that I bought a Big Lots from the east coast. The lucky polish that caught my eye was the light lavender purple with iridescent flakes, called Meet Me In Paris. Application was a little difficult but it turned out well after three coats. I had trouble with the slightly thick consistency and some mild patchiness in the first two coats. No topcoat in these pics. It's worth it though, the iridescent shimmer is utterly gorgeous and makes this polish look really heavenly. While I was browsing my polish drawers, I noticed a Lynnderella that I hadn't used in a while. Nosegay, with it's blue tinted lavender base has a similar base color as Meet Me In Paris, and contains some iridescent shimmer and light and dark purple hex and square glitters. Application was a breeze, especially with a fluid formula and no clumping of the glitters, and I only needed two coats over Meet Me In Paris for full coverage(boo, I covered up the iridescent flakes!). I used a layer of Essence Gel Look Nails to smooth out the mani and add shine. 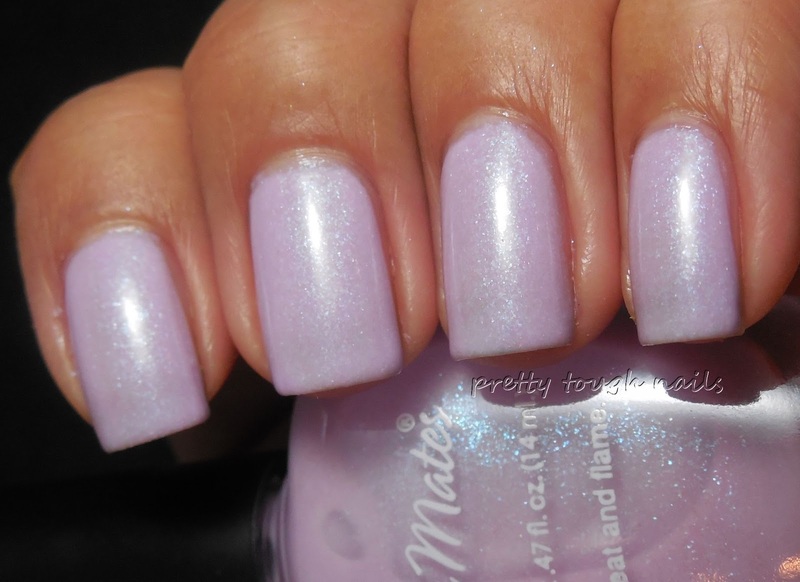 What a super feminine mani this turned out to be! I think it's the perfect mani to celebrate LO's birthday today. I don't use my Lynderellas as much as I should, and this mani reminds me how glorious those polishes can be. It's pricey, but I think there are some definite must haves from her collection. Are there any that Lynns that you love? This is so pretty! I wish I had gotten my hands on Nosegay before the prices went up. Gotta love those square glitters. Thanks Naz!! I hate the high prices too. I think I only purchased one more bottle after the price increase. I'd rather buy them off a blog sale for cheaper these days. This is a such a beautiful combo! I don't own any Lynn's, but I have been tempted to get one. Thank you! I think there are some standouts, but I wouldn't spend the money these days if you're not in love - there are so many cheaper and just as awesome indies out there! Beautiful combination! Nosegay is gorgeous. I also really like Meet Me In Paris. That shimmer is so beautiful and I love the name too.